Remember when Q&A introduced a latent, once media-frenzied issue of teen country girls running away from home and going to live in the city? And you thought, "Yeah, that's not for real."? And so did one of the helpful answer people in the original thread? Well, you're probably right. But according to some random, very unscientific Internet survey with a questionable sample, there's still a less dramatic basis for these stories. To it's credit, the surveyor got responses from nearly 200 males and 200 females each. 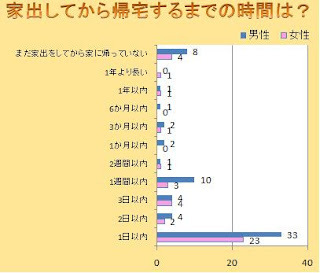 No age data is reported, but the online (and probably keitai accessible) nature of the survey would at least lead one to suspect that some teens replied to the questions. 家出をした事がある？: Have you ever run away from home? x represents numbers of respondents, with blue for males and pink for females. 家出してから帰宅するまでの時間は？: After you ran away, how long was it before you went back home? y represents time in ascending degrees, with the top response as "I still haven't gone back" and the most common response at the bottom as "within a day." 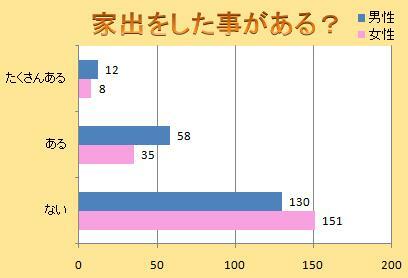 x is again number of respondents, with blue for males and pink for females. 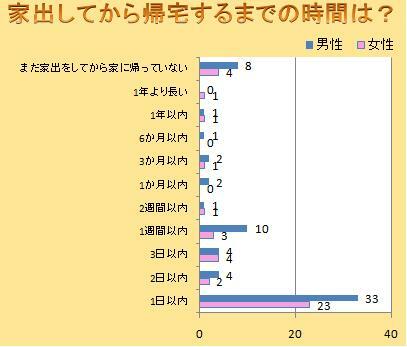 "Looking at the results, it appears that about 30% of boys and girls together have experience running away from home. That seems like a pretty big number to me. In regards to time, most of those runaways lasted less than a week, and runaway children returning home within a day are especially prevalent. I wonder if you can really even call that 'running away'? And I began to wonder what the children's motives are. Well, I guess if you just want to play with your friends then one day is enough. So what most of these subjects reported should probably be called "playing with friends" rather than "running away." I guess if they're being rebellious teens, that lets them think of what they're doing as "running away." Regardless, the approximate 20% of girls that have experience running away from home, at least in "little runaways" that end within a week, is a surprisingly large number. Instances of girls running away and engaging in enjo-kousai like the news is reporting might, on occasion, actually occur." 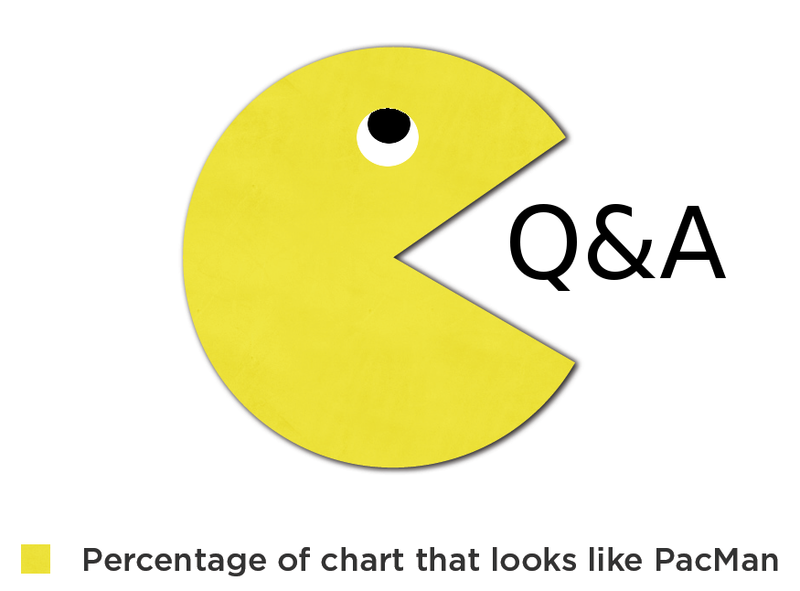 As always, we welcome your (enraged) questions and comments below!